Beautiful, slightly embossed arms can be reached both in the gymnasium and at home, you will just need dumbbells. If you do not have dumbbells, you can also pump up your arms at home with ordinary plastic bottles filled with water or sand. You can also use books, bricks and other weights that are jon hand. Remember that your goal is easily pumping muscles and working out problem zones, so do not use too much weight, we want to remain feminine and have refined arms. 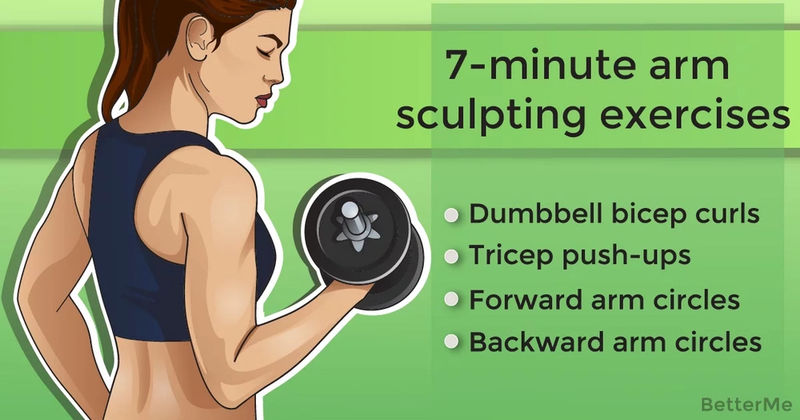 Before you begin to perform exercises for arms with dumbbells or any other weights, it is necessary to perform a warm-up. This will help warm up the muscles, make them supple and, as a consequence, avoid the occurrence of injuries during exercise. Do circular movements with your arms, shoulders and hands at one end and the other. You can do an exercise called "Scissors", alternating a large amplitude with a small one. Warming up arms should take 5-10 minutes.